The FREEBOX is a high-speed, high-quality broadband VoIP gateway, with built-in Quality of Service (it allows you reserve bandwidth for important services such as Voice/Video/Gaming). The FREEBOX is a Thomson SpeedTouch 716 (RRP79 GBP). The FREEBOX allows connection of multiple PCs, games consoles, and you can attach two standard telephone handsets and make FREE voice calls over your broadband connection. 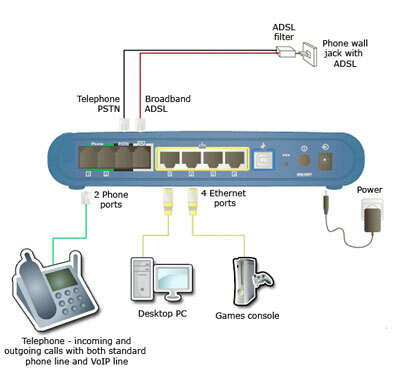 IMPORTANT: This is an ADSL router (Broaband delivered via your phone line) but it can be configured for CABLE and WIRELESS providers by converting one LAN port to a WAN port (only Dynamic allocation via DHCP is supported - ask your broadband provider if you are unsure). - Installation guide and support provided by email. - Goods are supplied with no warrenty whatsoever, we will not replace faulty units, we will not accept returns. - Post and packaging of 10 GBP (ex. VAT) will be charged to the card on your freespeech account. - Offer is subject to availability. - One unit per house household. - Offer is valid for the UK only. - Offer is for new customers signing up to an Unlimited Option.